Reducing the stomach size without cutting. Endoscopic Sleeve Gastroplasty is similar to a traditional gastric sleeve surgery because it reduces the stomach size to restrict the amount of food a patient can eat. ESG reduces the functional volume of the stomach by reducing the length and width of the gastric cavity. Gastric volume restriction is an important mechanism in achieving substantial weight loss, long-term weight loss. Who is is a candidate for ESG? Patients with a BMI greater than 30 with or without co-morbid conditions such as diabetes, hypertension of cholesterol/lipid issues or patients with BMI greater than 28 with co-morbid conditions. Patients must be able to undergo general anesthesia. What can be done with endoscopic therapy? Dr. Starpoli offers qualified patients a safe and effective incisionless, endoscopic suturing. Reported wight loss rages from 14-20% of total body weight at 2 years post-procedure. Review the ESG literature here. This procedure is performed using a small flexible endoscope and specialized devices that allows sutures to be placed through the endoscope. 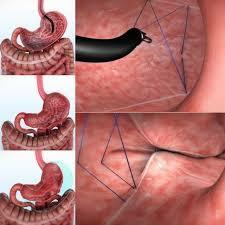 The scope and suturing devices are inserted through the mouth into the stomach in the same way as a standard endoscope. Sutures are then placed along the walls of the stomach to allow for constriction and reduction of the size of the stomach. Click here for more information regarding Endoscopic Suturing. Compared to formal surgery, recovery is faster and associated complications risks are much less. ESG offers an enduring weight loss result without cutting. It is anticipated that patients will feel little to no discomfort from the endoscopic procedure. Minor side effects may include gas pain, nausea, sore throat, swollen tongue, and lip pain from the insertion of the endoscope into the mouth. Patients typically return to their normal routine within 48 hours. Following endoscopic suturing patients are placed on a clear liquid diet and, eventually, follow the strict diet and exercise regimen. Will it be covered by Insurance? It depends upon the patient’s insurance plan. If not, self pay options are available. For further information, please speak with Dr. Starpoli at your next appointment.